Sometimes, all it takes to drastically improve the appearance of an old bathroom is a new vanity. Replacing an old vanity can be done in only a few days if you’re willing to do it yourself. 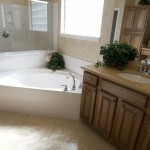 All you have to do is choose the new materials, including a sink, faucet, cabinet, mirror, and countertop. Even if you only have rudimentary plumbing and carpentry experience, you can save a substantial amount of money by doing it yourself. A new vanity can change the whole look of your bathroom without you having to do a total renovation. The first step is to shut off your water supply. You must then remove the plumbing connections running to the faucet and the waste drain below the sink. You should be able to unscrew them by turning them counterclockwise. If you have shutoff valves to direct hot and cold water, they will also need to be turned off. Be careful, as they may be leaky or corroded. It might be a good idea to replace old shutoff valves if they’re old. In order to physically remove your vanity, you will have to look at how the countertop of your vanity is attached. If it’s attached with silicon caulk, you can usually loosen it at a corner and use a keyhole saw to cut the rest away. If your vanity top is tiled, it might be nailed to the cabinet and you can get it free using a pry bar. Plastic laminate tops are usually secured using screws, which can be removed using a screw gun. If you can’t get the countertop off the vanity, you might remove it all together. This can be strenuous, but it usually comes free with some prying. Before you install the new vanity, think about cleaning up the wall area where the old one was. You might have to repaint, patch, or re-sand drywall that has been damaged. Once this is complete, you should mark the dimensions of the new vanity on the floor and ensure that everything fits properly. Your new vanity cabinet needs to be assembled before it is installed and attached to the wall. You can then place the cabinet in position and measure to make sure it is level. If it’s not you may need to insert a piece of wood between it and the wall or the floor. Once it’s in place, you can attach the cabinet to the wall using screws. The kick panel is the last part of the cabinet to be installed, and it should fit securely in the space between the front cupboards or drawers of the cabinet and the floor. Once the cabinet is in place, you’re ready to install the countertop, faucets, sink, and drain. 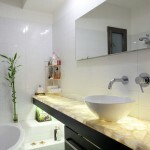 The sink should be set onto the vanity and dry-fitted to the walls. It should be as tight as possible in order to avoid leakage. The faucets and drain can be attached once the sink is in place. They should come with directions from the manufacturer, which should be followed closely. Direct supply pipes into the faucet before putting on the countertop as it will be physically impossible to do so when you the top of the vanity is in place. Once all of the plumbing elements have been connected securely, you can proceed to place the top on the vanity. Use silicon caulk to attach the vanity to the top edges of the cabinet. You will need to lift it and place it over the faucets and drain before setting it in place. Then you can connect the new supply lines to the shutoff valves underneath the cabinet, while making sure you don’t nudge the top out of place. Let it sit for a few hours without using the sink so that the caulk can dry properly. After that, you’re done replacing your bathroom vanity.